Getting started is Easy, Simple and Fun! It’s all about STYLE…. Your Style! Replacing a chair, sofa or some other furniture piece with a new one? Enhancing a corner space? Redecorating a room? Decorating a brand new home? Whatever your goal, Furniture Mall of Kansas can help you pull it all together! The designers of Furniture Mall of Kansas are ready to meet you and start assisting in making your vision a reality. We’ve found the relationship between designer and you is just as important as the advice so each of our qualified designers have a profile to let you know a little more about them. Let your FUN ideas pop! Our designers are set to meet with you and collaborate on all your ideas. 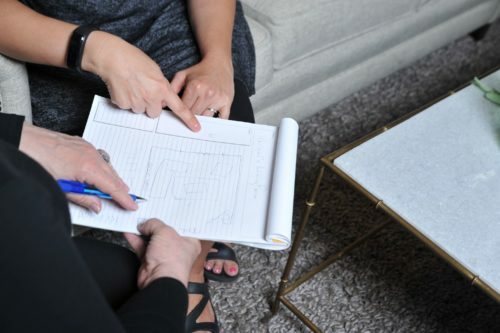 Whether that includes your style, specific colors or themes, the room to design or that Pinterest board you’ve had going for months, our designer will use it all to bring you a fully drawn out plan. Once the Designer has a fully visualized plan for your room it is time to unveil. Visually see the scale of everything for the room with chosen colors, furniture, accents and more. Once You say “YES” to the design plan, we will move into action to transform your room with that “OH Yeah” look you always wanted. Our Designers will be there each step of the way so you always know where progress is.